I’m pleased with my purchase, although part of me still wonders if I should have bought the other piece – or, better yet, found a way to buy both. But, having narrowly missed buying a cedar sculpture of the same subject a few weeks previously, I still half-feel that karma was urging me to the one I chose. The thunderbird, of course, is perhaps the best-known figure from First Nations mythology – although I would be hesitant to equate the figure found in the Pacific Northwest with similar ones in the Eastern, Plains, or Southwest cultures to any degree. In popular modern culture, the thunderbird is simply very large, and somehow creates thunder and lightning. However, among the first nations of the Pacific Northwest, the feature that makes it stand out is simply this: The thunderbird is a creature so large that it hunts whales. Considering that the killer whale is by far the largest animal seen from shore or near it – true whales being usually found further out – that makes the thunderbird a truly monstrous size. In “Thunderbird Capturing Killer Whale,” Russ has reduced the thunderbird’s size somewhat, making it closer to that of the killer whale, and the capture less one-sided than if the thunderbird was significantly larger. The thunderbird. It fills the left side of the piece, its head upraised in what looks like a grimace, identified by its curved beak (and, yes, those are teeth, and never mind that natural birds don’t have any). It grips the killer whale by its dorsal fin and head, almost hugging it with a wing that sweeps across the center of the piece. Otherwise, the killer whale lies passive in its grip, bent almost double by the thunderbird’s strength, so that its tail at the top right is almost at right angles to the head at the bottom center. The thunderbird may be straining, and appears buffeted by the loose tail, but the killer whale is caught and probably moments from death. What at first glance seems an abstract clutter of body parts becomes, on closer examination, a moment of tension, with greater violence due in a matter of seconds. The fact that the thunderbird appears almost whole– although in profile – while the killer whale takes a moment to recognize suggests the inevitable winner of the fight. So, too, does the difference in the eyes, the killer whale’s round one suggesting passiveness, compared the thunderbird’s elongated one. Yet this is not a formline design that keeps the eye moving around the entire composition until you have understood the various shapes. Only the wing operates in that way, the eye’s movement seemingly transferred to the wing itself, creating an impression that it is beating, another of the thunderbird’s weapon and, perhaps, helping it to hang on. On the rest of the thunderbird and all of the whale, the formline is more stiff, leading nowhere and slowing the recognition of the scene – an effect that reinforces the sense that the carving is capturing a brief moment of chaotic violence. Although you might not be able to see clearly from the photo, Russ’ carving of the scene reinforces the struggle by the depth of carving. Most of the sculpture is in low relief, the figures looking slightly squished. But the whale’s head is carved more shallowly than any other part, barely emerging from the background surface. By contrast, its still free tail is raised almost twice as high, and the thunderbird’s head and tail three or four times. However, for me, the master touch is that the piece is entirely in low-relief – all except for the thunderbird’s claws, which are in high-relief, and rendered realistically rather than with the usual shapes of the northern form-line. This difference literally makes the claws stand out from the rest of the design, making them identifiable when the rest of the carving is still a jumble of forms to your eye. In a very real sense, the claws are what matter most in the scene: they control the killer whale and will shortly rend it. 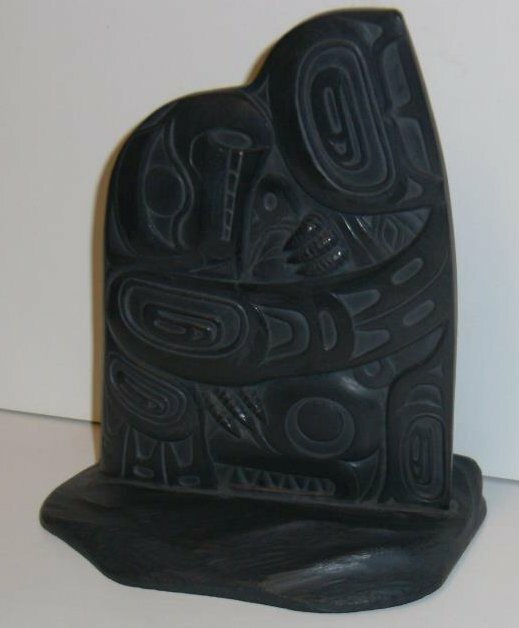 In the end, this reinforcement of the subject with technique that swayed me to buy “Thunderbird Capturing Killer Whale.” As I often do with sculpture, I am keeping it beside my computer desk, where I can appreciate it while I begin the leisurely process of deciding its more permanent position in my townhouse.